An oscilloscope is one of the handier pieces of equipment that you can have on your workbench, especially if you’re working with circuits that generate any kind of waveform or have any sort of oscillators. 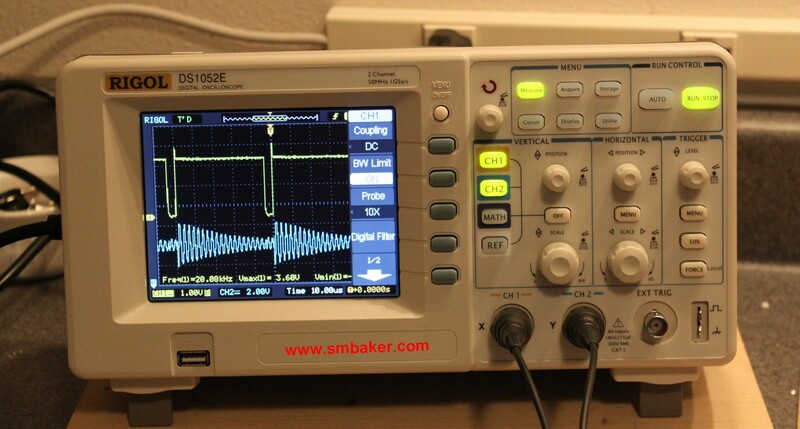 For about a decade I’ve had a decent B&K precision 20Mhz analog scope. I felt it was finally time to try upgrading to a digital storage oscilloscope. There were several options for inexpensive digital scopes. The first I looked at was the Instek GDS-1000 series, but I quickly found that much of the discussion of the Instek scopes also included comments about the Rigol units so I started looking into those. I found many positive reviews of the DS1052E. I went ahead and ordered one from an Ebay seller who was also a registered US Rigol dealer. There used to be a lot more Ebay sellers (most of them unregistered, not official dealers) and the prices were more competitive, but the powers that be have clamped down on that, so expect to see only a few Rigol scopes on ebay. Other options include buying the scope from overseas (i.e. dealextreme or similar companies), but that can incur a lengthy shipping delay from China or Hong Kong. The scope arrived double boxed and in good shape. It included a couple decent 1X/10X probes, power cord, CD, etc. One early point of confusion was the included Ultrascope software which had some installation problems. The ultrascope software requires the National Instruments VISA runtime (aka VISA32.DLL) and Rigol foolishly included a version of the runtime that was either broken or otherwise included an incompatible DLL file. Some googling revealed the correct version of the NI runtime could be found at http://joule.ni.com/nidu/cds/view/p/id/1071/lang/en. One expects Rigol will fix the installation CD to have a compatible runtime, so if you order your scope, hopefully the problem will be fixed. The scope itself is a pleasure to use. It has a color screen, so the two channels appear in different colors. It’s capable of performing a variety of automated measurements (frequency, period, min/max V, peak-to-peak V, etc). It can save waveforms to external storage (USB card) which can then be recalled later or viewed offline on the ultrascope software. There’s really little to say about a scope… it does what it’s supposed to do, and it does it well. It’s also very compact, using a fraction of the desk space that my old analog B&K did. In summary, the DS1052E is a good scope. It does what it’s supposed to do. It does it well. It does it in color. I have no complaints. I would appreciate to know your opinion about the functional/mechanical stability over time of this scope. I am more interested in the 300MHz version (approx. $2000) but I am not sure if this scope quality justify such a spending. An Agilent DSO1022A has 200MHz BW and about the same price, but I think it’s probably more stable. Is it? Stable means working in the same way over long periods of time. I have had mine for a couple of years. I brought it to work so I could get some time on it. We also have a color Tektronix here. I prefer the Rigol to work with. It’s easy to use with consistent results. About the frequency response: I converted mine to 100 MHz then tested the result. It was 3dB down at 119 MHz. There was a 1-2 dB dip around 80 MHz. The feature I really like over the Tek is the FFT feature. The Rigol is relatively easy to use. The result displays as a third trace and you can use the cursor to id frequencies displayed. By the way, don’t drop it. On mine the smaller transformer in the power supply broke loose. It supplies the back light. It was a bear to fix.